The Smart Grid is a more reliable, environmentally friendly, efficient and secure power grid. It is a multi-faceted and integrated solution to the problem of modern energy delivery that encourages consumer participation and incorporates distributed energy resources, such as renewable generation, energy storage and Plug-in Electric Vehicles (PEVs). 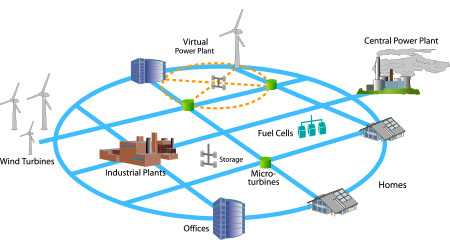 Smart Grid is also a vast information network that relies on high-speed, two-way communications, real-time monitoring and control of system assets, and advanced analysis and automation systems. OSI defines the Smart Grid as an intelligent and interactive dynamic organism that reacts, interacts, incorporates, self-corrects and stabilizes itself around a new operating point. In this new energy era, a new breed of utilities will emerge. OSI's vision of the Utility of the Future is an agile and progressive enterprise that embraces modern technology and end-to-end integration with suppliers and consumers. It is an enterprise that maintains a substantial renewable energy portfolio, offers consumer-friendly Demand Response (DR) programs, and is engaged in pragmatic Smart Grid initiatives. The Utility of the Future will require powerful and super-scalable automation systems to flexibly manage growth and maintenance of real-time operations. This has created a demand for a new generation of intelligent systems, operating platforms and application software that proactively manage grid reliability, grid security and consumer initiatives. In response to this demand, OSI has created the ideal software platform for supporting Smart Grid initiatives: monarch/SGP™ (Smart Grid Platform). This secure, high-performance platform is designed to process and analyze millions of data points in real time from all levels of the electrical power supply chain, whether generation or consumption. In addition to SCADA, EMS, GMS and DMS applications, monarch/SGP supports a multitude of standard enterprise interfaces, such as MultiSpeak® and Service-Oriented Architecture (SOA) APIs, which would allow real-time integration of systems and components from different levels of the utility enterprise (AMI, OMS, etc. ).